Beast Kingdom introduces the D-Select series, which allows you to put together the Disney diorama of your dreams, and recreates classic movie characters and scenes with expert professional techniques. From the character's expression to minute scenes details, the D-Select series provides collectors with a detailed, exquisite addition to their collection. Disney classic Lilo & Stitch is leaping off the screen and into your life! 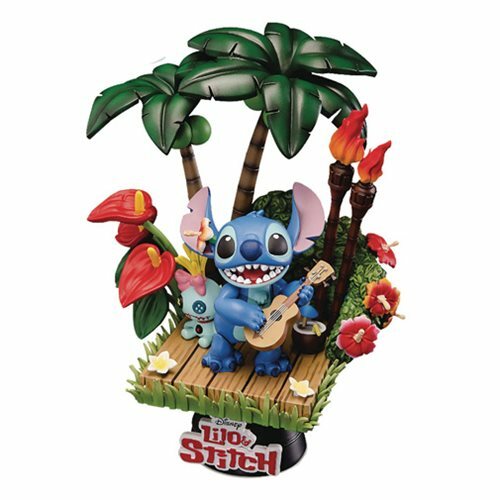 Lilo & Stitch D-Select Series DS-004 6-Inch Statue - Previews Exclusive brings you the popular character from Lilo & Stitch: Experiment 626 (Stitch) in his daily life in traditional, sunny Hawaii! The 6-inch statue concentrates the warmth of the Hawaiian islands, and the detailed design and fine painting bring Disney to life, shake himself off, and take Scrump through the swaying palm trees and colorful flowers of the island, all while happily singing a traditional song. The special logo tag and special platform design add depth and a feeling of liveliness to the statue. Ages 15 and up.